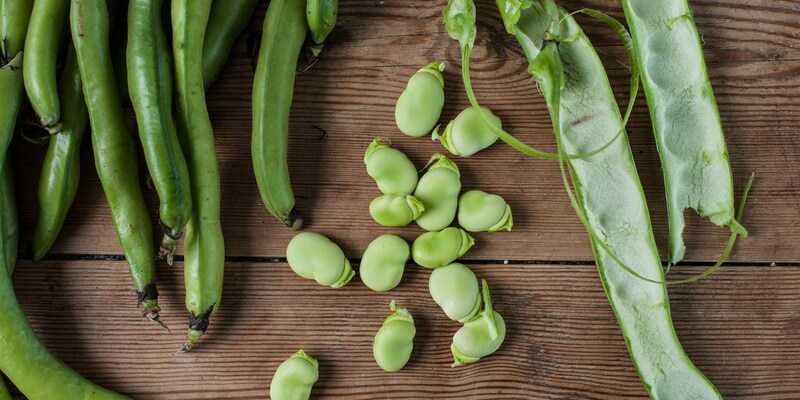 Broad beans (or fava beans as they are know in the US) are part of the legume family along with garden peas and chickpeas and originate from the Mediterranean, although the exact location is unclear. Broad beans are a very easy plant to grow, making them a favourite with aspiring gardeners and savvy horticulturists alike. In season in the UK between late May and early September, these kidney-shaped beans are a good source of protein and high in vitamins A, B1 and B2. When buying, look for broad beans with firm and crisp shells that are blemish-free with no air pockets. Opt for the smaller beans, which will be sweet and creamy – large beans will have a chalky, mealy texture and are best left for soups and purees. Broad beans will keep in the fridge for two to three days raw but once cooked are best eaten the same day when at their freshest. Broad beans that are very young and small (less than five centimetres) can be cooked and eaten whole, much like you would a pea. Any bigger than this and it is necessary to remove the beans from their outer pod before cooking. For the best flavour, always double pod the beans. To do this, remove the beans from their outer shell and blanch in boiling water for a couple of minutes before refreshing in a bowl of iced water. Once the beans are cool enough to handle, simply make a nick in the second shell (which will have come loose during cooking) and pop out the bright green bean inside. The ratio of whole broad bean to final podded bean isn’t high, but they will be worth the effort. The fresh, creamy texture of broad beans make them a good match for salty foods such as bacon, Parmesan and anchovies. Galton Blackiston combines New potatoes with samphire and broad beans and tops with an oozing poached egg for a magnificent seasonal starter. Broad beans also make a great match with most shellfish; Martin Wishart includes them in his starter of Orkney scallops baked in the shell with morels. More robust red meat works wonderfully with broad beans and lamb is a classic summertime pairing, especially with the addition of mint. Try Shaun Hill’s Rack of lamb with sweetbread pie and gravy or Bryan Webb’s Roast lamb with parsley and pine nut stuffing. Freshly cooked broad beans are a welcome addition to any summer meal. Robert Thompson’s Buffalo mozzarella with peas, broad beans, mint, lemon and olive oil is an easy starter to throw together, while Paul Heathcote’s Couscous is just as speedy and simple to add to a midweek meal. For something a little different, try Nuno Mendes’ Charred broad beans with St Jorge cheese and brioche crumb as a vegetarian canape at a dinner party.